Makes about three seven-inch soccas. 1. In a large bowl, sift chickpea flour, salt, and pepper. Whisk in warm water and olive oil. 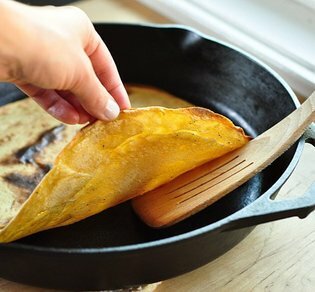 Let sit, covered, for as many hours as possible (making this before you leave the house in the morning is perfect for making socca for dinner), but let it sit covered for at least 30 minutes. 2. Place heavy (preferably cast-iron) skillet in oven and preheat to 450 F.
3. Remove skillet from oven. Add a Tbsp of coconut oil to the hot pan, and pour batter in a steady stream until it reaches the edges of the pan. Bake for 8 to 10 minutes or until the pancake is firm and the edges are set. 4. At this point, you can flip the socca, or set it a few inches below your broiler for a couple minutes, just long enough for it to brown. Cut into wedges and serve hot, with toppings of your choice, or let it cool and use as a wrap stuffed with your favorite fillings.